Are you a recruiter in Ireland? Do you want more exposure for your tweets? Send me your twitter name – just or mention @IrishRecruiter on twitter. Here is the up to date Irish Recruiters list on Twitter. Irish recruitment websites fall into two groups. First advertise their prices online and others do not. I always wondered why is that? The last two sites Jobs.ie and Irish Jobs do not have their prices published online. Now I realise why! Those are the two most expensive jobs sites in Ireland. Irish Jobs almost 10 times more expensive than the rest? They must have a really great sales team…. Now in all fairness, in a few minutes on the phone Jobs.ie did drop the price to €350 and Irish Jobs gave a whopping €150 discount to a total price of just €800. 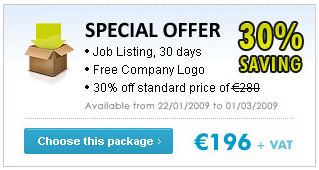 Another available option is LinkedIN where you can post a job for €195. With 34 jobs posted for the whole country, it does not seem to be a greatest place to advertise a job. Or a hidden gem? The cost of job advertisement in Ireland varies greatly. The web sites without the pricing clearly displayed seem to be by far the most expensive. Honestly I do not see how they justify the prices. Also their sales team has to be applauded. They will look for the commitment before close of business at 5PM. They would explain it with some ‘Cut off’ imaginary time for all ads of the day. All in all, serious sales training is involved there, and it’s obvious from the first 30 seconds on the phone – when they avoid telling you the price at all costs. It is interesting to see how the overpriced Irish jobs sites started reducing their prices drastically. I just saw this ad this morning, and I still think they should reduce it much, much more, but at least it is a step in the right direction… Perhaps a too small step and too late?